Captain Steve Rogers (Chris Evans) is getting comfortable with his new life in the 21st Century. He runs dark ops for SHIELD along with the Black Widow (Scarlett Johansson), but is getting tired of being Nick Fury’s (Samuel L. Jackson) lapdog, especially when secrets are kept from him. Simultaneously, Fury is investigating secrets being kept from him regarding a new, sinister SHIELD project headed by Alexander Pierce (Robert Redford), which leads Captain America down a dark path crossed by the mysterious Winter Soldier (Sebastian “spoiler alert” Stan). Suddenly things are revealed to be not what they seem and Cap must call upon his new friend Sam Wilson (Anthony Mackie) to help set things right. 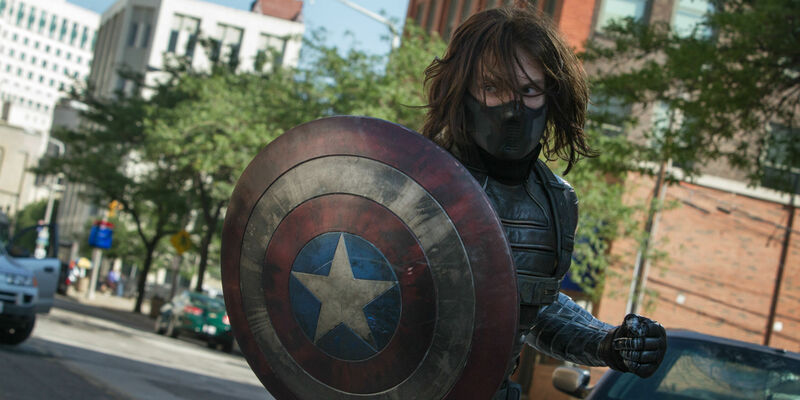 Captain America: The Winter Soldier is arguably the best movie Marvel has made so far. At least, I think so. It stands very well on its own and works as a fairly tense spy-thriller with superhero trappings. Since my mom likes movies that trend toward the slightly dryer and realistic world of political (and/or legal) intrigue, I thought that she would really enjoy this movie. Unfortunately, since coming back from her vacation, my mom has caught a bit of a cold, and slept through a lot of the movie, even though we split it up into two sittings. Regardless, she enjoyed the parts of it she did see. Before we started, I had to re-cap (haha “re-Cap”) her on the politics of the Marvel Universe. Since it’s been a while since we’ve heard from SHIELD, she needed a refresher course on who they were and what HYDRA was, especially since our last mention of HYDRA was just a short throw-away mention in The Avengers. That being said, the movie did a great job of reminding her who everyone and everything was with a lot of well-crafted dialogue and context clues. She remembered everything, even Toby Jones as a computerized Arnim Zola, which I was impressed by. But she still refers to Nick Fury as Samuel L. Jackson which, again, is still completely accurate. However, the big attention grabber this movie afforded my mom was Robert Redford. She loves Robert Redford, and was surprised that he was in the film, even though I had told her about him, like, three times beforehand. His presence also helps the film attain an air of legitimacy in the political intrigue genre it’s straddling. Speaking of surprises, this movie has quite a few of them. So if you haven’t seen this movie: a) Spoiler Alert and b) Why are you reading this blog? The third surprise is the fact that they kill Nick Fury in the second act. As soon as Sam Jackson flat-lined on the operating table, my mom immediately declared: “He’s not dead. No one stays dead in these things.” I had to stifle myself from revealing anything further. But, suffice to say, she did not bat an eye when he resurfaced in the third act. The movie ends with a high-stakes assault on three helicarriers which, to be honest, is the most paint-by-numbers aspect of the movie. The heroes have to do three identical things to bring the villains’ plan crashing down (quite literally) and if they fail at even one of those points, they fail at everything. Despite the cookie-cutter action movie plan, the sequence was a blast and a joy to watch. Except for my mom, who fell asleep during most of it. She’s never been one to be entranced by fighting and ‘splosions. She did, however, pay attention to the final battle between Cap and Bucky. Despite Bucky’s saving Cap at the end, she still thinks he’s a bad guy. Overall, The Winter Soldier proves itself both to be an enjoyable, interesting movie that conveys a lot of nice twists while simultaneously providing a refresher on that state of the Marvel Union through well-written interesting dialogue and context. It also gave my mom a great bit of nap time, while I balanced on the edge of my seat. The elevator fight was also well received. Despite knowing that nobody really dies, she was convinced that Black Widow died when she shocked herself. …but she still thought Robert Redford would survive. Sequence 2, wherein Bucky goes to the museum. Previous Previous post: 0.2 Improved Social Media!